The theme is a concept that the incoming prefects agree on the year before, and one that they, and the Director of Student Leadership and Activities, center their Orientation Week planning around. They’ll use it to focus their programming for the whole school year, and use it as a recalibration tool if they seem to get off-track. Safiya and Aashiyana laugh after falling to the ground due to an overly powerful bear-hug. During their meetings throughout the school year, the prefects will check in. “Does it seem like students are ‘joining in’ in their activities and classes? Are we, the leaders of the student body, ‘joining in’? If not, what can we do about it?” But it’s also a directive for every Laker, and isn’t limited to students, either. The theme “Join in” might sound broad. It could simply mean “do an activity.” But at La Lumiere, everyone does activities – and lots of them. 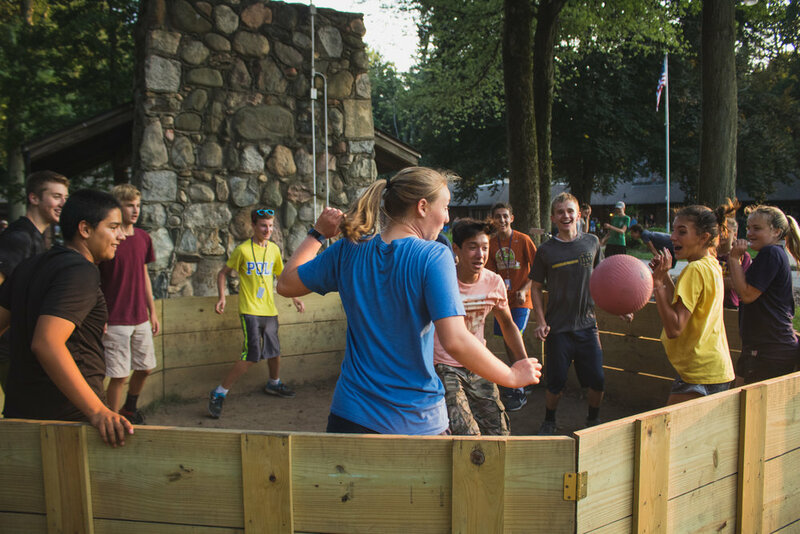 A group of freshmen play gaga ball during Orientation Week, in the new pit built by students in May 2018. The significance of “Join In” lies in the very fact that it is so all-encompassing. It’s a phrase that compels you both to pay a little more attention in class when you’re feeling grumpy and tired, and to stand up on stage in front of the entire student body and recite a poem you wrote about your deepest fears. It’s a reminder not only to make each day count, but to do so in a way that will allow you to look back on your La Lu experience with the deep satisfaction of knowing you did as much as you could, and that you did it all with a grateful heart and an open mind, embracing others in the community all along the way. So, in 2018 and 2019, we’re all joining in.